Makes it simple to disconnect from tubing when getting up during the night , Specifically designed for extra softness and stability. Soft and Flexible Frame Sits underneath the eyes and adapts to different facial types, while integrated padding adds softness. 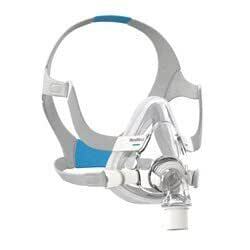 ResMedâs softest mask ever, the AirTouch F20 is the very first to feature the revolutionary ResMed UltraSoftâ¢ memory foam cushion. Conforming to the unique contours of each face, this memory foam cushion is designed to deliver a light, breathable fit across a range of therapy pressures.